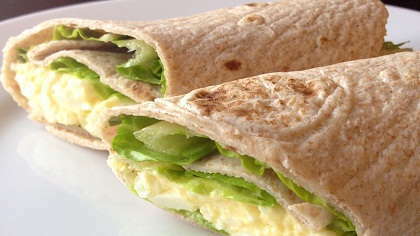 Egg salad takes on a healthier form with a wrap! This wholesome wrap is easy and fun for kids to make themselves. Just keep peeled boiled eggs in your refrigerator for a quick grab-and-go ingredient. 1. Place eggs in a small bowl and press with fork until crumbly. 2. Mix in mayo or yogurt and salt and pepper to taste. 3. Cut Romaine leaves to fit the full width of the tortilla wrap. 4. Place the lettuce leaves on the wrap, side by side, to cover the wrap surface. 5. Scoop egg mixture onto the Romaine leaves. 6. Carefully roll wrap into a log securing with a toothpick if needed. 7. Cut wrap on the diagonal to form two halves. 8. Serve with a side fresh cut fruit, veggies, or pickles.